Hot Tub Snorkeler Loves SilkBalance in His Hot Tub! My wife and I just purchased a new Jetsetter hot tub. We are using the Silkbalance water care system and we love it. 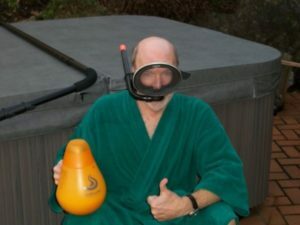 We used chlorine alone in our old hot tub, and my wife had to limit her exposure to the water because her skin was quite sensitive. With the Silkbalance system, she has been able to go hot tubbing every day, and has not experienced any skin irritation or redness. The Silkbalance system really works as advertised. Now we are wondering why we went without it for the last seventeen years. (Editor’s note: SilkBalance has only been available in the U.S. for two years). Thanks, Walt for sharing! Love the photo. If your hot tub gives you dry skin and makes you itch, switch to SilkBalance today! Easy care-no mixing, testing or adding of anything but SilkBalance and a small amount of sanitizer and that’s it! Saves time & money! All natural-safe for you and safe for pets and the environment. And, the best benefit of all: silky, smooth skin that makes hot tubbing fun again! Easy ordering from Olympic Hot Tub Company e-store. Happy New Year & Happy soaking.